If you’re participating in my FREE 8-Day ‘Cleanse Your Closet’ Challenge, then this one’s for you! (And if you’re not, you should be and you can sign up right here – this fun challenge is a great way to press ‘reset’ in your closet and lay a foundation to rebuild your personal style. You can start at any time!). One very important aspect of cleansing and editing your closet it making it easier for you to access and actually SEE the clothing you have. Why? Simply put, so that you can better navigate through your ‘best of the best’ clothing AND actually wear them! You invested a good amount of time throughout this challenge editing key areas of your wardrobe. You’ve freed yourself of clothes that no longer serve you and are left with ONLY clothes that fit you well and are doing you justice! 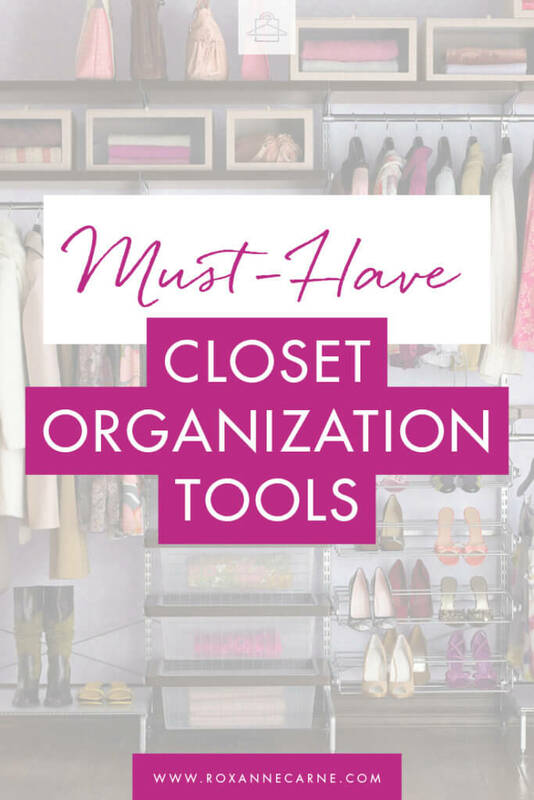 So now that you have a closet full of clothes that you CAN and WILL wear, I’m going to share a few of my favorite closet organization tools that will help you keep your closet in check, better protect your clothes, and maybe even convert your closet into your own little boutique! In order to fully appreciate the awesomeness of Slimline hangers, you need to understand the real deal about wire and plastic hangers and why you should avoid them at all costs. First of all, wire and plastic hangers often create a little pesky triangle that pops out of the shoulder area of your garment. And this is only from just being hung up! You know what I'm talking about! These hangers are especially the worst with knits or delicate fabrics and are truly ruining your clothing. Also, they snag clothes so easily. Wire hangers are one piece of wire that’s literally twisted together near the hook. The end of the wire is cut raw and fully exposed with nothing covering it all. It’s just waiting to snag that lovely silk blouse you adore. Oh, and they’re not very sturdy either! Wire hangers can also bend and contort into odd shapes depending on what you’re hanging. (The truth is that if the garment is that heavy, it should probably be folded anyway!). When it comes to rips and snags in clothing, plastic hangers are another likely culprit. Plastic hangers are made in a mold – a very cheap mold. When you purchase a pack of these bad boys, it’s not uncommon to see or feel the seam (where the mold ends) running alongside the entire hanger. In many cases, you can even see and pull off little stringy pieces of plastic that are left over from manufacturing! You do not want this unfinished product (literally!) snagging your clothes. One more thing: they’re kind of thick and take up more room in your closet. They’re shaped like a natural human shoulder – They have a rounded slope at the edges. So when you hang your clothes, it’s almost as if they’re still being worn! If you compare this to wire hangers (the #1 worst) and plastic hangers (the #2 worst), you’ll see a big difference. Your clothes won’t slip off – They’re typically made from velvet (or a velvet-like material) that creates a gentle ‘grip’ for your clothing. No more clothes sliding off the hanger and onto your closet floor. They look soooo good – Having a closet full of these hangers instantly make your closet look more organized, uniform, and classy – just like a boutique! They’re versatile for many types of clothing – There are a few different types of hangers (blouse hangers, suit hangers, etc.) and you can use them with clips to hang skirts, pants, etc. Most also have notches that are great for hanging spaghetti strap tops, tanks, etc. Again, they don’t slide off! They pack well – If you’re headed on a trip, these easily fit in a suitcase and weigh almost nothing. I always take my own Slimline hangers whenever I travel because a) I often need more hangers than what’s available in the hotel closet, LOL and b) I don’t want to gamble on whatever types of hangers the hotel has in their closet. 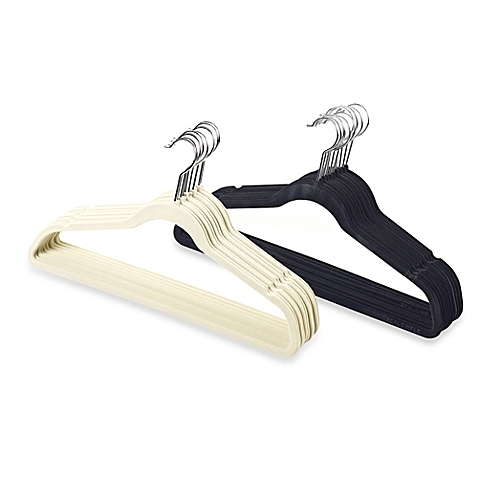 Convert your closet with Slimline hangers with ease – available at Amazon! So promise me after reading this NO MORE WIRE (OR PLASTIC) HANGERS in your closet! It feels SO good to get that out of my system! Okay, onto some more of my favorite closet organization tools! While we’re talking about hangers, here are a couple more smart hanger options that will help you maximize space and allow you to see what you have. Keeping scarves and belts rolled up in drawers (in a tidy manner, of course) is an option, but it’s so much easier to have them hanging and fully visible in your closet. Scarf/belt hangers are a convenient way to display these accessory options for your outfits. These special hangers come in all shapes and sizes, but they essentially have the same function! Even though I love my Slimline hangers, if you want to create even more space in your closet, you can place your pants on these nested stainless-steel pants hangers. The stainless steel is very smooth making it easy for you to slide pants on or off! Nesting several pairs on one hanger will give you so much space in your closet – it’s totally worth it! Okay, here’s another awesome (and inexpensive item) you can invest in to better organize and protect your clothes – breathable garment bags. They’re woven fabric garment bags that you can use for any type of garment storage (except furs). What many people don’t realize is that clothes need to breathe and they need to be aired out. Placing them in plastic garment bags is a no-no, especially long-term. Breathable garment bags are an excellent option for long-term storage and are super convenient for travel, too! Like it or not, remember that pretty harsh chemicals are involved in dry cleaning. And let me tell you, leaving your freshly dry-cleaned clothing in the plastic bags they come home in is probably one of the worst things you can do for your clothes. When your dry-cleaned clothes arrive at home, they MUST air out immediately. Remove them from those plastic bags ASAP. Long-term storage in plastic bags like these can result in discoloration, drying/cracking (of leather), etc. So definitely check out some breathable garment bags (available in varying lengths) to help protect your clothing – both short- and long-term! Who says that regular hangers are the only items that can be used to store clothing in your closet? Efficiently utilize your space and give yourself extra storage options by introducing hanging shelves into your closet. I LOVE these and use them in my closet! They’re collapsible shelves that conveniently hang from any closet rod and open up accordion-style when hanging in your closet. You can get them at various widths, lengths, shelf quantities, colors, materials, etc. They’re handy for storing bulkier foldable items like sweaters, winter scarves, or even shoes and handbags! As you can see, you can use hanging shelves for any item you desire and have the flexibility to place it wherever you want in your closet. Pretty neat, huh? I’m sure you can recall a time when you’re searching for a particular pair of shoes but have no idea which shoe box they’re tucked away in. Or you have an outfit you’re trying to pair with a shoe, but you have to rely on your memory to see if it’s a match until you unearth the shoe from its box. Problem solved! Use clear shoe storage boxes! These are simple, yet useful closet organization tools that will save you lots of time and energy! These boxes are stackable and come in various sizes so you can store your everyday shoes and boots, too! You can quickly and easily find your shoes which will help you pull together outfits in a snap. You can also arrange them by type and color, too! One thing I’ll say though is to be careful with storing leather shoes in plastic containers. I mention this because leather should ideally breathe and have access to some level of humidity (normal room humidity is just fine). So, if you want to store them in clear plastic boxes, you totally can, but bring them out every once in a while for some air and maybe even some moisturization with a leather moisture kit. We don’t want them getting dry and crackly over time. Okay, this definitely another favorite of mine when it comes to organizing your closet – the Little Black Dress Jewelry Organizer. It’s cute and feminine! It's shaped like an LBD but has compartments and loops to hold all sorts of jewelry: earrings, rings, bracelets, necklaces – whatever you please. The best part is that the compartments are clear so you can see what you have without pulling it out! This is a convenient tool that also gives you more opportunity to pull together fantastic looks all within your closet! 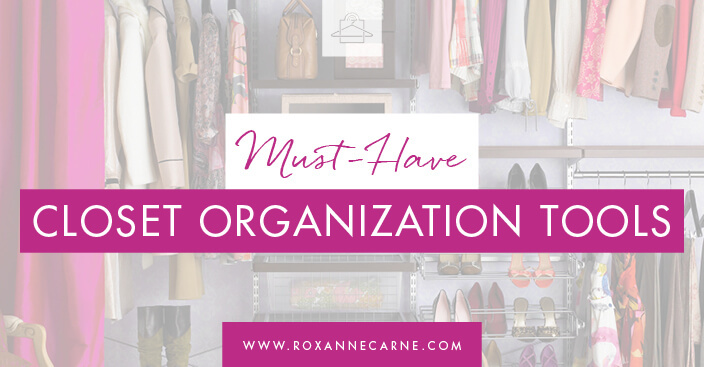 So there you have it – in tandem with the Cleanse Your Closet Challenge, you discovered my top 7 closet organization tools that will help you keep your closet in check after your major purge. You’ve transformed your wardrobe and you’re transforming your life – one step at a time. I’d love to hear what your favorite closet organization tools are! Post them in our private Cleanse Your Closet Challenge Facebook group or in the comment section below! Thank you for these recommendations. I’ve been keeping my shoes in the original shoe box. I like the fact that I can stack the boxes on top of each other. However, I must admit, sometimes I end up looking through five boxes before I get to the shoes I wanted to wear. I’m going to purchase clear shoe storage boxes.